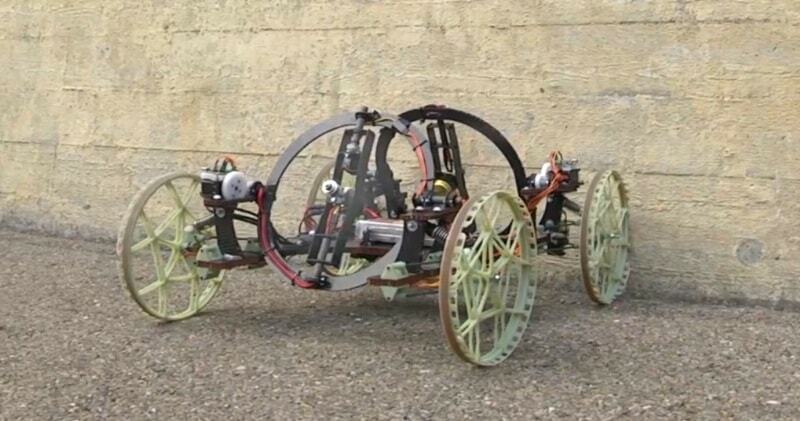 Home Technology VertiGo-The Wall-Racing Robot, Which Is Able To Drive On Walls And Floor! VertiGo-The Wall-Racing Robot, Which Is Able To Drive On Walls And Floor! This wall-racing robot is able to drive on the floor as well as on walls and transition between the two automatically.It was created during a one year project at ETH Zürich as a collaboration with Disney Research Zürich by team VertiGo. The robot has two tiltable propellers that provide thrust onto the wall, and four wheels. One pair of wheels is steerable, and each propeller has two degrees of freedom for adjusting the direction of thrust. The fans then tilt automatically to use the force air to keep the robot pressed against the wall while moving forward. The same process repeats when the robot reaches another wall, the ceiling or the floor.There are eight individually-controlled actuators and a computer that allows the operator to control the propellers and drive the robot.